Writing, mainly. I had these two scenes in my head and wanted to get them written down before they went away. I'm up to about 7,000 words, and there was very little writing Thursday. This morning I woke up realizing I wanted to take another run at the Tango scene. (No, Stampede bars typically don't play Tango music, but some C&W music has a Tango beat.) From the same start, to the same end, the original had 773 words, and the rewritten version has 610 words. I've just reread them both, and the rewritten version is better. It's probably still too long, but good enough for now. I think that scene is over, with them walking back to the table after the dance. We don't need to know what happened on the way home. I think. I was reviewing my notes about the book ending, and I'm trying to work up the nerve to write it. There's a bit of a gap between what I have, and the ending I want. What's that called? A leap of faith? Something like that. Thursday night was my writers and bloggers meet up. Lots of fun, mostly we talked about the recent writing convention. We had a 5 word game. Mine was - The CASTLE guard ate a LEMON TORTILLA and was overcome with EMOTION as he vomited onto the STRAW. That got a round of applause, but I hadn't realized we were supposed to write 2 paragraphs. I though it was MAX 2 paragraphs, and I was feeling like being short. 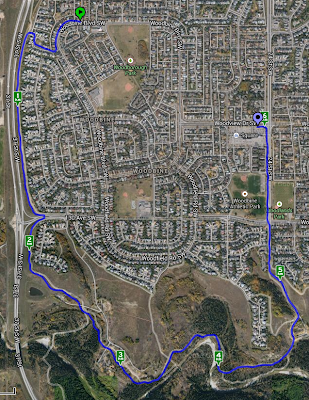 Ran through Fish Creek this afternoon before the rain, aiming for an easy run the whole distance, and this time the Runmeter mapping worked. Here's the route. 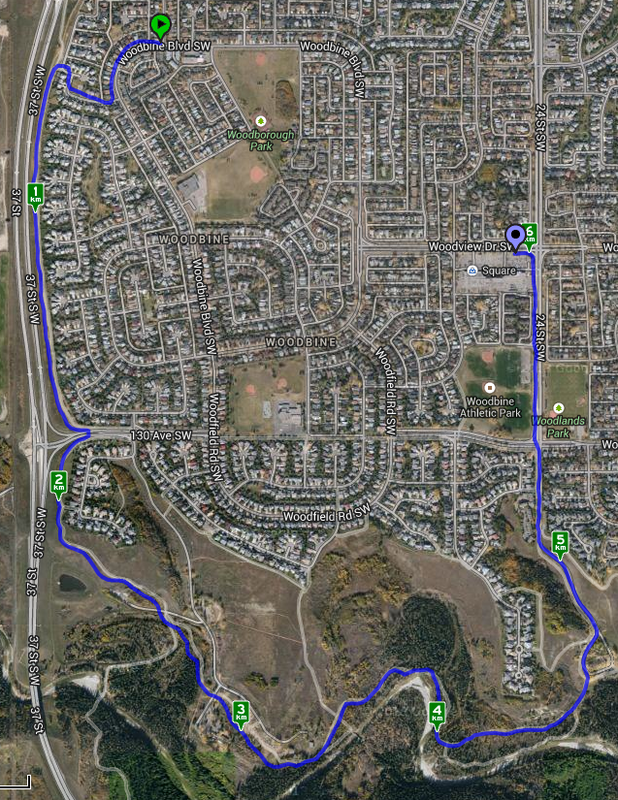 What's interesting is that The big downhill into the park starts at 2K. I don't know what that huge dip is that the chart shows just after 3 K. The path is pretty flat there. The big spike at 4 K is running on the trail where the path washed out, complete with roots and a tricky side hill that had me walking. The slow bit on the hill up 24th St is self explanatory. 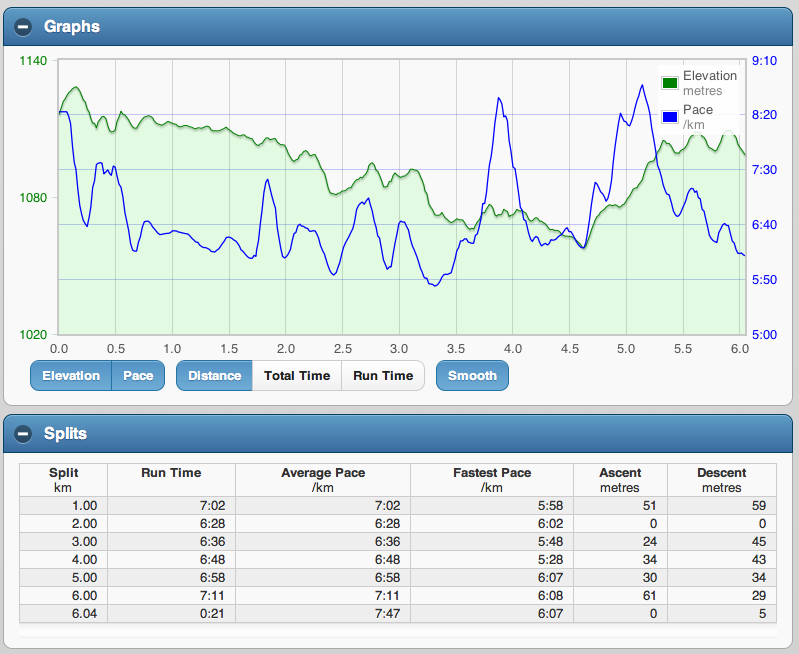 I was hoping for 7 K, but settled for 6, with my feet and legs still happy. I think another K would have got miserable pretty quickly. A good stretch and a bit of core rounded it out. Some photos. I was sitting on the patio the other day, facing the window for some reason. I was taken by this grumpy cat face. 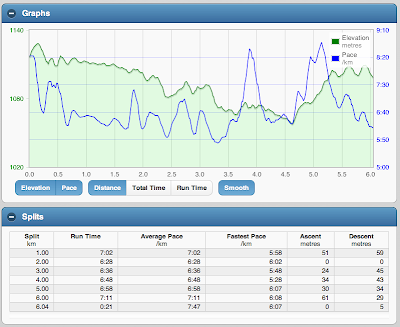 My feet haven't even been out of those shoes for more than a few seconds after a hot run. I was trying to get her with her little face right in the shoe, but she was too quick, the little cat sweat pervert. After the rain today, a rainbow. This is the first one I've Snapseeded. Oh, and the final review of business tax paperwork. I must get that done this weekend. I'd rather be writing.